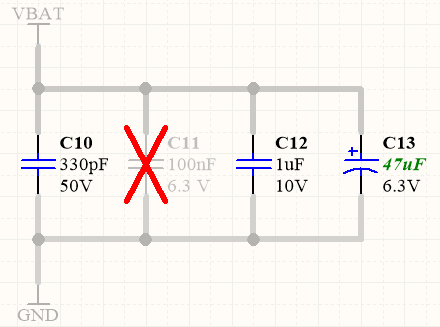 This article take a closer look at how you define and manage variants in CircuitMaker. In CircuitMaker there are two types of components, logical components, and physical components. This distinction is important, as it underlies some of the most powerful features in CircuitMaker. The components you place on the schematic sheet are logical components, each a conceptual entity that represents the actual component that is ultimately mounted on the assembled PCB. While this one-to-one, logical-to-physical model works well for a simple design, it cannot support all of the design requirements needed by the electronic product designer today. CircuitMaker supports powerful concepts like: multi-channel design, where a section of circuitry is stamped out as many times as you require; and variants, where a single design can be implemented with different components fitted to each variant of the board. Features like this require the ability for one logical component to represent multiple physical components. CircuitMaker delivers this one-to-many capability through its compiler technology. When you compile your logical design, each physical component is instantiated in memory, ready for transfer to the board design workspace. Because there are situations where you, the designer, still need access to the physical components at the schematic capture stage, the physical design is also made available in the schematic editor. The physical components are accessed via the extra tab(s) at the bottom of each schematic sheet. The left-most tab is the logical design you captured, the other tab(s), called the compiled tab(s), represent that chunk of physical design as it will be transferred to the PCB design workspace. 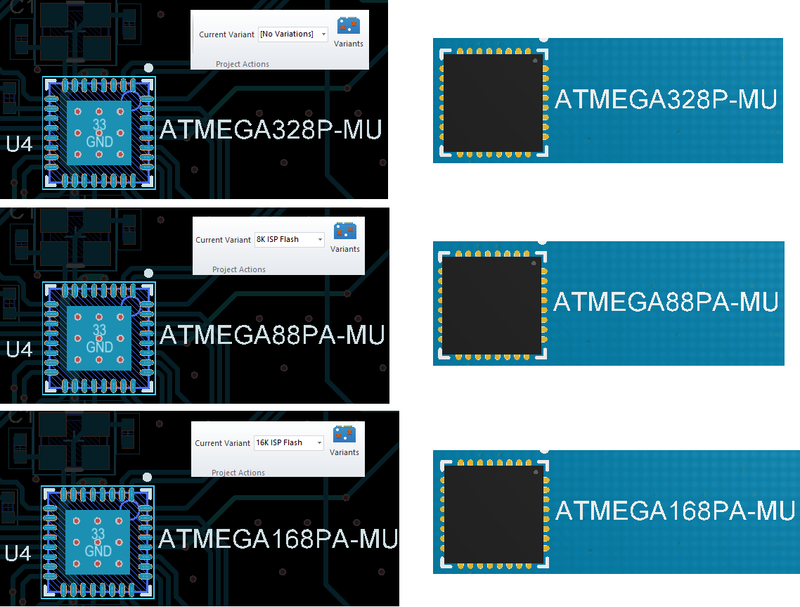 Note that the schematic that is presented on the compiled tab cannot be graphically edited, for example you cannot modify the wiring, or move a component. To examine design variations, you must compile the design and then switch to the compiled tab of the schematic. The Project | Project Actions | Current Variant field can then be used to show the configuration of the physical components on that sheet, for a chosen variant. Note that when you switch to a compiled tab the available menu entries on the Ribbons will change, reflecting the commands that can be run when you are viewing the physical design. 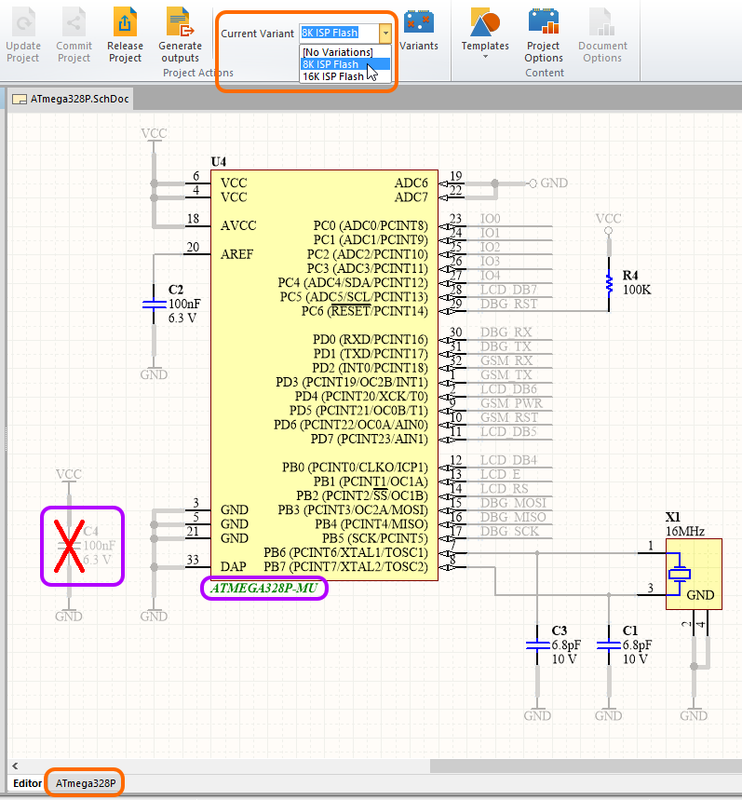 Click on the logical design tab (Editor) at the bottom of the schematic sheet to return to the standard, editing menus. Before you can create a variant, you first create the original design, which is referred to as the base design. Working from the base design, you then go through a process of configuring the components to be: Fitted; Fitted with varied parameters; or Not Fitted. Fitted - this is the default state of a component, if it is Fitted, then it is not varied. When you create a new variant, all components default to Fitted. A component with a state of Fitted is represented in the Variant Management dialog as an empty cell - more on this dialog later. Fitted with Varied Parameter(s) - a component can have any of its parameters varied, as part of the variant definition process. Modifying the value of a parameter is a local variation, only affecting the output documentation. The original schematic, and the component whose parameter is being varied, are not modified in any way. In the image below, C13 has the Value parameter varied, this variation is shown by displaying the Value using a green, italic font. Not Fitted - if a component is set to Not Fitted, it still exists on the schematic and is transferred to the PCB, but it is removed from the appropriate output documentation, such as the BoM. You can configure how Not Fitted components are presented in the documentation, for example they can be marked with a cross on the schematic and in PCB drawing outputs. 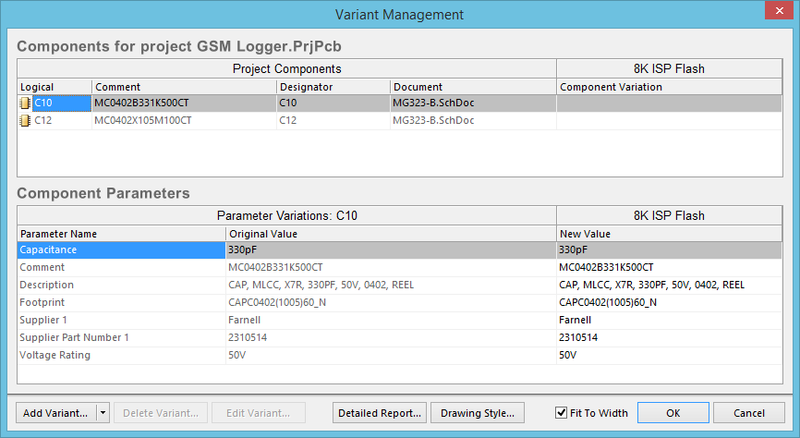 For detailed information about the dialog and its options, see the Variant Management dialog page. Click the Add Variant button in the Variant Management dialog to create a new variant of the base design. The Edit Project Variant dialog will open. Use this dialog to give the variant a meaningful name, and specify any required variant-level parametric data. The Add Variant button includes a dropdown, use this to access the Clone Selected Variant command. Cloning is an excellent timesaving feature when you need to define a number of variants that are very similar. An additional column will appear on the right of the Variant Management dialog, with the just-added Variant description as the column title. All the cells will be empty, an empty cell indicates that this component is Fitted, and is unchanged from the base design. You are now ready to configure the components for the new variant. Example of a newly added variant. Fitted - the original component as used in the base design is also fitted/used in this variant of that design. For a newly added variant, all components are fitted by default. The cell for a fitted component is empty. Note that individual parameters can also be varied for a fitted component - simply type in the new parameter value - varied parameters are shown in bold. To make a variant active, either click on that variant's name in the column header, or click in any of that variant's cells. To display only those components being varied, right-click in the upper region of the dialog and select Only Show Varied Components from the menu. The Variant Management dialog, with columns hidden and a filter applied to only show components that are Not Fitted. As the designer you have control over the way in which varied components are presented on the schematic sheets (which then flows through to printed or PDF'd outputs), and in PCB drawing type outputs, such as assembly drawings. These are configured in the Variant Options dialog, as shown below. To access the dialog, click the Drawing Style button at the bottom of the Variant Management dialog. 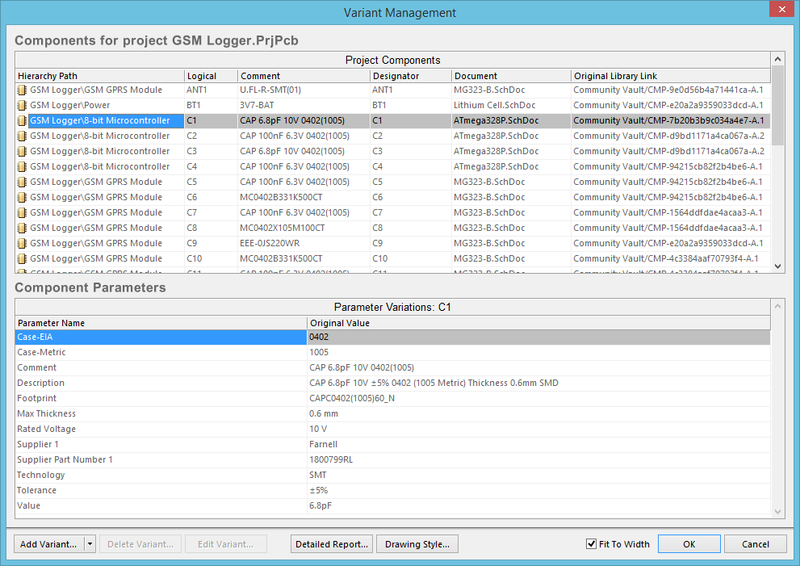 When you configure variations in the Variant Management dialog, the settings are saved in the project file. This includes the Not Fitted state, and local parameter variations to a Fitted component. The Variant Management dialog includes commands for resetting parameters, back to the standard values used in the base design. 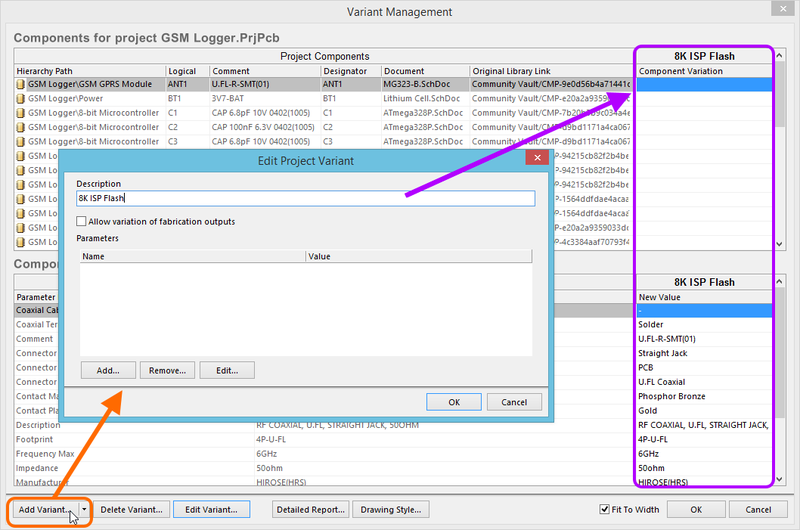 The Variant Management dialog supports multi-select, this means you can select many or all components across many or all variants in the upper region of the dialog, and then perform parameter update actions on one or more parameters, for one or more components, in one or more variants. As an example, you might want to reset the manually varied parameters for all components, in all variants. Use the Only Show Varied Components right-click menu option, in combination with the right-click Filter options, to only Show Fitted with Varied Parameters. The upper region of the dialog should now display only those components that have manually varied parameters. Right-click in the upper region of the dialog again and choose Select All from the context menu. All components currently displayed in the upper part of the dialog will be selected. Now right-click in the lower region of the dialog and choose Select All from that context menu. All parameters for all components will now be selected. Note that you could have chosen the Select Column command instead, to only apply the Reset action to the components in a specific Variant. 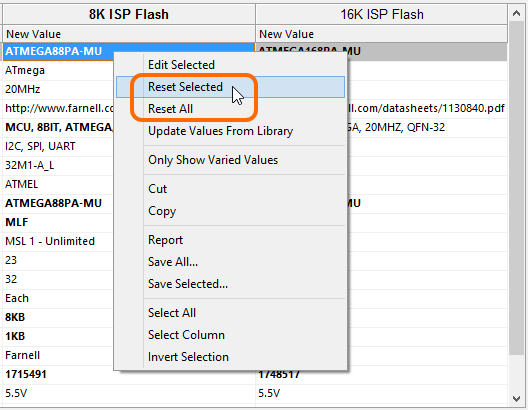 Right-click again in the lower region of the dialog, and choose Reset Selected from the context menu, as shown in the image below. Alternatively, after step 2, you could simply Shift+click to select a single cell in each variant in the lower region, then right-click and use the Reset All command. CircuitMaker supports parameters at various levels of the project. For example, you can add document-level parameters to each schematic sheet in the Document Options dialog. You can also add project-level parameters to the project, on the Parameters tab of the Options for Project dialog. Parameters can also be added to a variant, in the Edit Project Variant dialog. That means the parameter value defined in the schematic document overrides the value defined in the Project options, and the value defined in the variant overrides the value defined in the schematic document. Note that schematic-level parameters are not available on the PCB or in the BoM, for these types of output you should use project or variant parameters. It is important during design capture that you have complete visibility of the component variations used in each variant. To support this, the schematic editor includes a number of features, as described below. 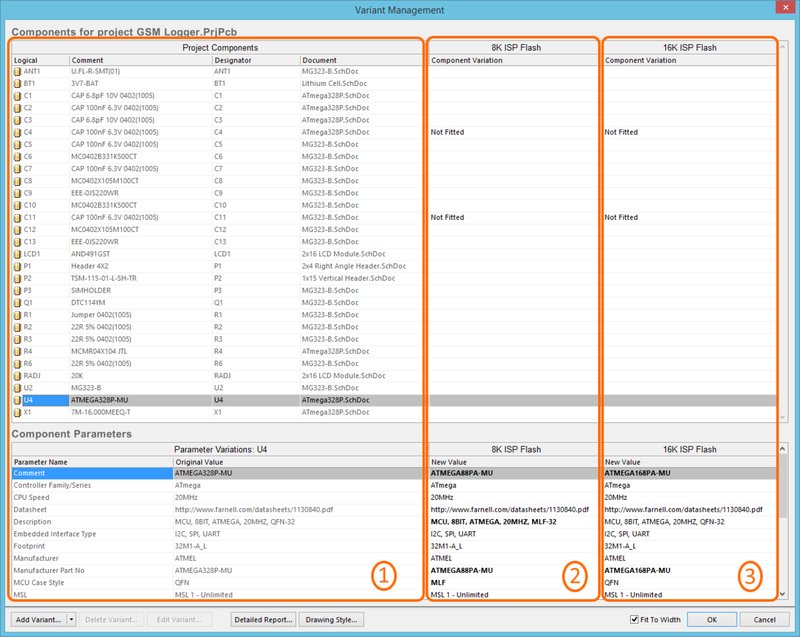 Select the compiled sheet and the Variant (orange highlights), to view the components varied on the schematic sheet. It is often easier to work directly from the component(s) placed on the schematic sheet, rather than scrolling up and down through a list of components in a dialog. Simply select the component(s) on the sheet, then right-click and select Part Actions » Variants from the menu, as shown below. Two capacitors have been selected on the schematic, use the right-click command to configure just those components in the Variant Management dialog. Note that the right-click Part Actions sub-menu also includes a command to Toggle Fitted/Not Fitted. You can also perform a local parameter variation directly on the schematic, by double-clicking on the parameter. The Variant Management dialog will open, displaying only the selected components. Perform the required variations and click OK to apply them to the design. The Variant Management dialog has been opened from the schematic sheet, detailing just the two selected capacitor components. You can use this technique when you are first setting up component variations, or when you need to modify an existing component variation. 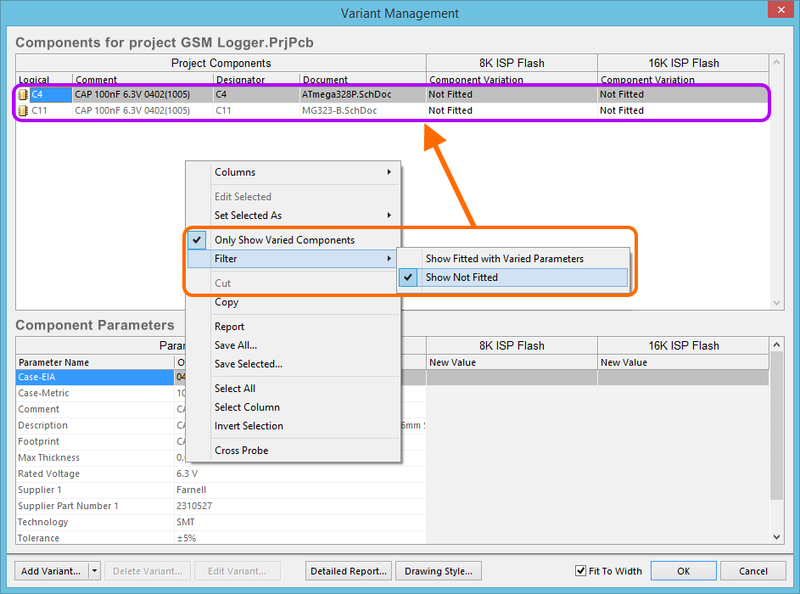 In addition to only presenting the selected component(s) in the Variant Management dialog, if there is a variant currently selected in the Project | Project Actions | Current Variant drop-down, then only that variant will be presented, irrespective of how many variants might actually be defined for the project. Variation of single component parameters can be performed through the Parameter Variation dialog (double-click on a component parameter to open the dialog). In the PCB editor, all of the component footprints, for all variants, are always shown. This is necessary because all footprints, for all assembly variants, must be fabricated as part of the bare board. It is the loading of components during the assembly process that then determines which variant is being built. Because all footprints are always visible on the PCB, it can be difficult to know which components belong to which variant. 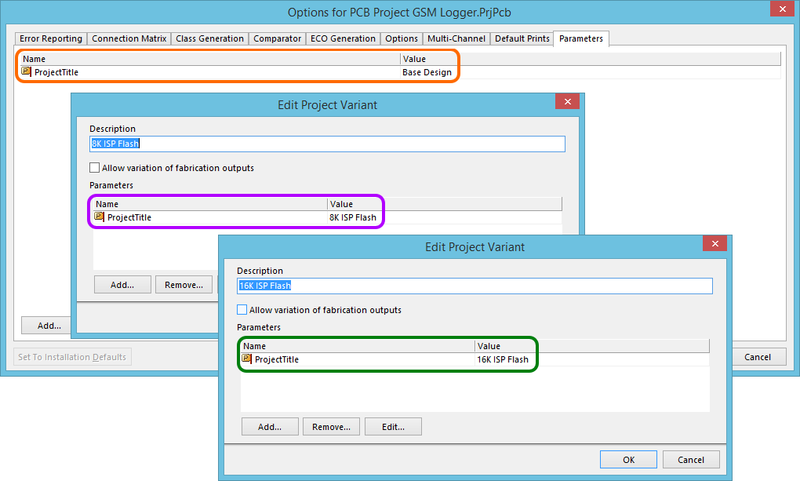 The PCB editor provides the Project | Project Actions | Current Variant dropdown, which can be used to switch between variants. However the only visible clue to tell if a particular component is fitted or not fitted in that variant, is if the component includes a 3D Body, then that body will appear/disappear to indicate when the component is fitted or not fitted. This fitted/not fitted behavior can be seen much more easily when the PCB is in 3D Layout Mode, as demonstrated in the animated image below. variants, of an example board design project. CircuitMaker allows fabrication outputs to be driven by variants. More specifically, this allows you to specify a change to a component's Comment parameter, and that change will be passed through to the fabrication output – the silkscreen layer of the generated Gerber or ODB++ output. 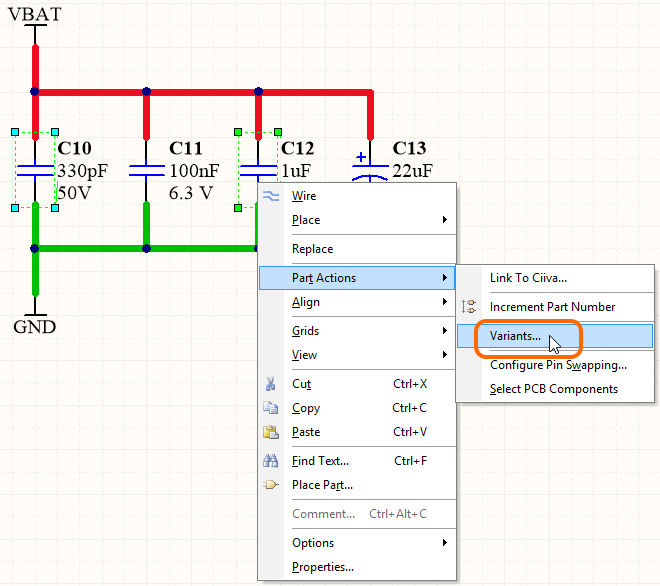 The PCB Editor supports the visual display of such a change, the Comment field reflecting the value assigned for the currently chosen variant, directly in the workspace. To pass a changed Comment value for a variant through to the fabricated bare-board, you need to enable the option that allows that particular variant to drive fabrication outputs (in the Edit Project Variant dialog, enable the Allow variation of fabrication outputs option). 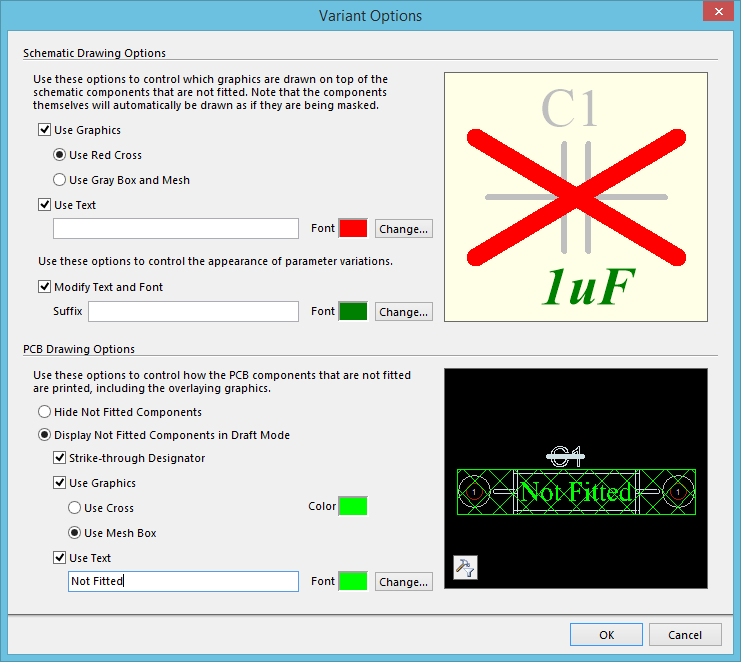 However to see the change in Comment between variants visually – presented in the PCB workspace – does not require this option to be enabled. With the variants defined, simply locate a component of interest in the PCB workspace – whose Comment parameter is varied – and switch the current variant from the Project | Project Actions | Current Variant drop-down field. The displayed value for the comment will change in accordance with what has been defined for that current variant. The changed comment for a particular variant can be viewed on the PCB irrespective of viewing mode – 2D or 3D. If you change the comment for a component while viewing a particular variant (not the base design), you will be alerted to the fact that doing so will change its variant value. By clicking Yes, not only will the displayed comment change in the workspace, but the new value will be committed for that component in the current variant. This can be verified by looking at the Comment entry for that variant, in the Variant Management dialog. Component UID mismatches are automatically resolved, simply close the dialog and save the project to retain these corrections. Duplicate designators must be resolved at the schematic level, recompile the project and check the Messages panel for warning/error details to resolve these. Resolve designator and UID mis-matches before continuing with the design process.